Hibbing, MN: Wimp Press, 1966. Mimeographed pirate edition of Dylan’s first book that wasn’t officially published until 1971. Octavo, 54 pages, original pages as issued. A very good example with the cover a little rubbed and marked, the staples buckled and not quite reaching through to the rear. The contents are clean throughout with mild toning at the margins. One of the several pirated editions of Dylan’s novel, taken from the Macmillan 1966 proofs after production was delayed, pre-dating the 1971 trade edition. 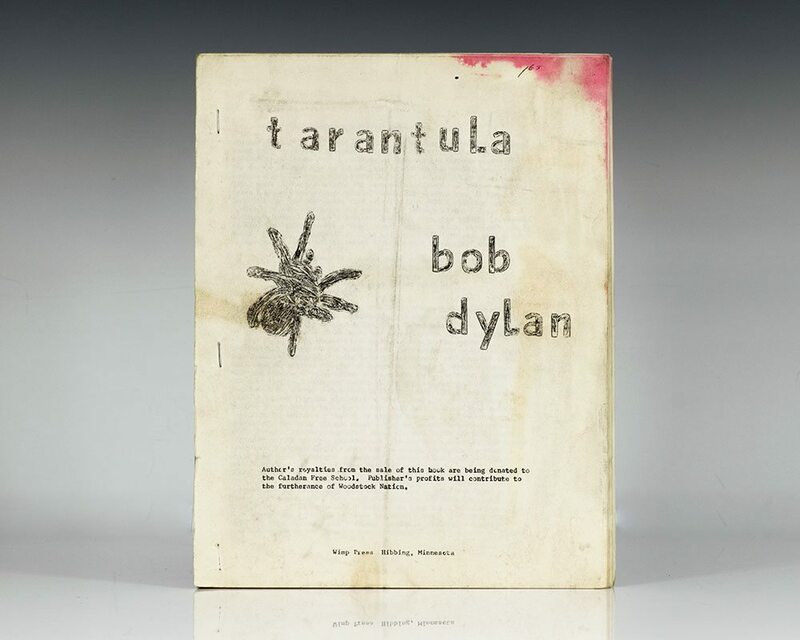 Written in 1966, Tarantula is a collection of poems and prose that evokes the turbulence of the times in which it was written, and gives a unique insight into Dylan's creative evolution. It captures Bob Dylan's preoccupations at a crucial juncture in his artistic development, showcasing the imagination of a folk poet laureate who was able to combine the humanity and compassion of his country roots with the playful surrealism of modern art. Angry, funny, and strange, the poems and prose in this collection reflect the concerns found in Dylan's most seminal music: a sense of protest, a verbal playfulness and spontaneity, and a belief in the artistic legitimacy of chronicling everyday life and eccentricity on the street. Dylan, Bob; Joan Baez; Jack Elliott; The Greenbriar Boys; The New Lost City Ramblers; Peggy Seeger; Introduction by Pete Seeger. New York : Simon & Schuster, 1963. First edition of this collection of songs from the 1960’s folk music scene. Quarto, original cloth, with 112 pages with photographs. Signed by Bob Dylan in a contemporary hand on the front free endpaper. Features photos and tabulature of music by Joan Baez, Bob Dylan, Jack Elliott, The Greenbriar Boys, The New Lost City Ramblers and Peggy Seeger. Introduction by Pete Seeger. Notes by Earl Robinson. Rare and desirable signed by Dylan. New York: MacMillan & Company, 1966. 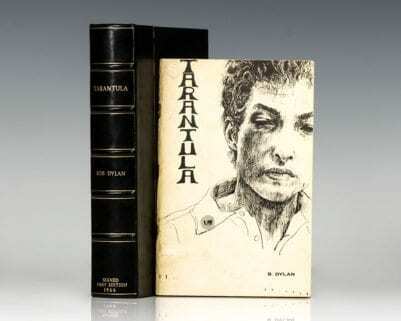 First edition of Dylan’s first book. Octavo, original cloth. Signed by Bob Dylan on the half-title page. Fine in a near fine dust jacket with some light wear to the extremities. Housed in a custom half morocco clamshell box. Rare and desirable signed by Dylan. Madison, Wisconsin: Wimp Press, c. 1966. 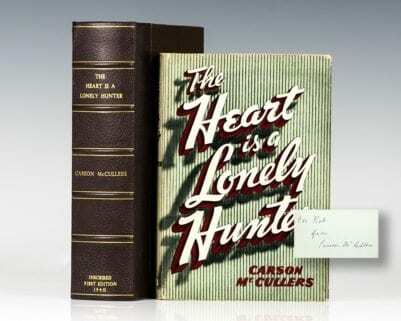 First pirated edition. Octavo, original wrappers as issued. Signed by Bob Dylan in a contemporary hand on the title page. A very good example with the cover a little rubbed and marked. One of the earliest pirated editions of Dylan’s novel, taken from the Macmillan 1966 proofs after production was delayed, pre-dating the 1971 trade edition. Housed in a custom half morocco clamshell box. Scarce and desirable signed by Dylan. Dylan, Bob & John Elderfield. London: National Portrait Gallery, 2014. Signed limited edition, number 19 of 21 signed copies. Signed and numbered by Bob Dylan on the title page. In fine condition. Dylan, Bob and Pete Seeger. 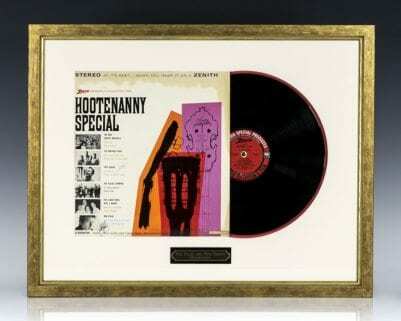 Hootenanny Special: Featuring Bob Dylan and Pete Seeger. Original stereo LP put out by Zenith featuring various folk singers, including Bob Dylan and Pete Seeger. Signed by both Bob Dylan and Pete Seeger in contemporary signatures on the front panel of the record sleeve. It features Dylan singing: Don’t Think Twice, It’s All Right and House of the Rising Sun; Pete Seeger singing, John Henry and Follow the Drinkin’ Gourd; New Christy Minstrels Californi-o and Rovin’ Gambler; Brothers Four San Francisco Bay Blues and Michael; Village Stompers If I Had a Hammer and Reilly’s Daughter. Matted and framed. The entire piece measures 20 inches by 25.5 inches. Contemporary signatures on an original record are rare. New York: M. Whitmark & Sons. 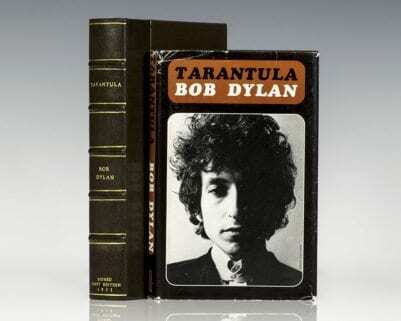 First edition of this music collection of the songs of Bob Dylan. Quarto, original illustrated wrappers as issued, frontispiece portrait of Dylan after a drawing by Cambert, illustrated. Signed by Bob Dylan on the front free endpaper. Introduction by New York Times folk music critic Robert Shelton. Photographs by Chuck Stewart. In very good condition. Housed in a custom half morocco clamshell box.